BAGLEY — The environmental movement chose a small Minnesota town as the battleground for its latest fight. A judge in Clearwater County dismissed the case Tuesday against three people who were charged with damaging a pipeline in 2016. And while they have made their point, they all traveled a long way to do it. Among the seven people sitting in front of the judge, only two were from Minnesota, and only one was from Clearwater County. The defendants, who have referred to themselves as “valve turners,” shut off the valves of two Enbridge Energy Co. pipelines near Leonard, Minn., in October 2016 as a way to protest the oil industry’s contribution to climate change. The action was part of a coordinated effort across several states almost two years to the day of Tuesday’s court hearing. In Clearwater County, Emily Johnston, of Seattle, was charged with causing property damage to a pipeline. Both Annette Klapstein, of Bainbridge Island, Wash., and Benjamin Joldersma, of Seattle, had been charged with aiding the property damage of a pipeline. 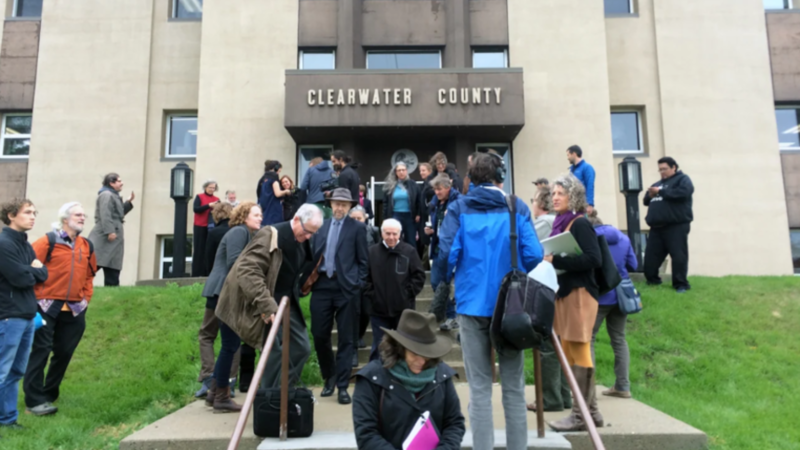 “We are obviously relieved that the criminal charges have now been dismissed, but there is a lot of work to do with regard to climate change and the underlying issues,” said Lauren Regan, one of the three defense attorneys in the case. Like the defendants, their legal team traveled thousands of miles to fight the battle in the small northwoods town. Regan works with the Civil Liberties Defense Center in Eugene, Ore. The team also consisted of Kelsey Skaggs from the Climate Defense Project in San Francisco and Twin-Cities based attorney Timothy Phillips. But Tuesday’s dismissal did not garner unanimous approval from those watching from afar. The judge, Robert Tiffany, dismissed the case at the defense attorneys’ request midway through the second day of trial after County Attorney Alan Rogalla rested his case. Tiffany granted the dismissal based on arguments from the defense attorneys, one of which was that the prosecution failed to prove the defendants had damaged the actual pipeline rather than merely the chains and locks bound to the pipeline valve. Once the decision was announced, applause and celebration broke out in the courtroom, which had extra seating to accommodate the crowd. All told, there were approximately 65 people in the audience of the small courtroom, according to the courthouse staff. Tuesday started with the seating of 12 jurors and two alternates who had been selected after a full day of deliberation Monday. During that process, many of the potential jurors had provided mixed opinions on the validity of climate change. The prosecution then brought forth both Clearwater County Sheriff Darin Halverson as well as Enbridge supervisor Bill Palmer to testify. Under cross-examination, Palmer testified that simply shutting off the valve would not have caused any damage to the pipeline. It did, however, cause significant loss of production for the company, which was essentially the intent of the valve turners. Palmer testified that each of the two pipes the defendants turned off was capable of transporting as many as 33,000 gallons of oil an hour. Since the company had to shut down the pipelines for eight hours following the incident, the valve turners effectively delayed the transportation of more than half a million gallons of oil. Rogalla also showed a video the defendants filmed the day of the incident. It showed the defendants approach the valve site and then call an Enbridge representative on the phone to explain what they had done and why they did it. “For the sake of climate justice and to ensure the future for human civilization, we must immediately halt the extraction (and) burning of Canadian tar sands,” defendant Joldersma could be heard saying on the video while on the phone with Enbridge. The defense requested to have the case dismissed before it ever brought forth any of its own witnesses, even though Regan said her clients wanted to testify. The defense also intended to invoke the “necessity defense,” which would have allowed them to claim they performed the crime as a way to prevent greater harm. Since the judge dismissed the charges early, the defendants did not get to use the defense they had planned. “I also admit that I am disappointed that we did not get to put on the trial that we hoped for,” Johnston said. In October 2017, Tiffany ruled the defendants could use the necessity defense, but prosecutors appealed that decision all the way to the Minnesota Supreme Court, which declined to hear the case. By doing so, the high court essentially backed the Minnesota Court of Appeals, which had sided with the defendants. Requesting the dismissal also may have been an early exit strategy for the defense since it had sustained a blow earlier in the day. Tiffany ruled the defense’s expert witnesses could not testify on the effects of climate change, explaining it could prejudice the jury. In addition to the three defendants in Clearwater County, there was an activist from at least one of the other valve turner trials who came to court Tuesday. Michael Foster spent time in prison for his part in a similar event in North Dakota. The valve turners have been at least somewhat successful in communicating their core message in the two years since they carried out their plan against pipelines. In February, the New York Times Magazine published a 6,400-word story on the environmental activists who were involved in the coordinated act of civil disobedience, including both Johnston and Klapstein. A writer from Wired Magazine was on hand for Tuesday’s proceedings. The defendants and their legal team fielded questions on the courthouse steps shortly after the judge made his announcement. Joldersma stood with his 8-year-old daughter, indicating it was partly for her generation that he helped take part in the valve turner activism. Klapstein said the time frame in which climate change can be reversed is continuing to narrow and they will continue to work toward mitigating its effects. As Trump stacks he judiciary with evangelical judges who are all in on fossil fuels, these good decisions will be more rare. Vote for representatives who will block these nominations.